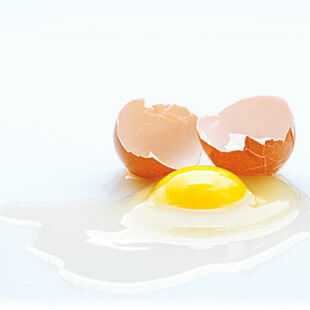 The Truth: Eggs do contain a substantial amount of cholesterol in their yolks—about 211 mg per large egg. And yes, cholesterol is the fatty stuff in our blood that contributes to clogged arteries and heart attacks. But labeling eggs as “bad for your heart” is connecting the wrong dots, experts say. “Epidemiologic studies show that most healthy people can eat an egg a day without problems,” says Penny Kris-Etherton, Ph.D., R.D., distinguished professor of nutrition at Penn State University. For most of us the cholesterol we eat doesn’t have a huge impact on raising our blood cholesterol; the body simply compensates by manufacturing less cholesterol itself. Saturated and trans fats have much greater impact on raising blood cholesterol. And a large egg contains only 2 grams of saturated fat and no trans fats. The American Heart Association recommends limiting cholesterol intake to less than 300 mg daily—less than 200 mg if you have a history of heart problems or diabetes or are over 55 (women) or 45 (men). “That works out to less than an egg a day for this population—more like two eggs over the course of the week,” notes Kris-Etherton. Myth 2: High-Fructose Corn Syrup (HFCS) is worse for you than sugar. The Truth: The idea that high-fructose corn syrup is any more harmful to your health than sugar is “one of those urban myths that sounds right but is basically wrong,” according to the Center for Science in the Public Interest, a health advocacy group. The composition of high-fructose corn syrup is almost identical to table sugar or sucrose (55 percent fructose, 45 percent glucose and 50:50, respectively). Calorie-wise, HFCS is a dead ringer for sucrose. Studies show that HFCS and sucrose have very similar effects on blood levels of insulin, glucose, triglycerides and satiety hormones. In short, it seems to be no worse—but also no better—than sucrose, or table sugar. This controversy, say researchers, is distracting us from the more important issue: we’re eating too much of all sorts of sugars, from HFCS and sucrose to honey and molasses. The American Heart Association recently recommended that women consume no more than 100 calories a day in added sugars [6 teaspoons]; men, 150 calories [9 teaspoons]. Myth 3: A raw-food diet provides enzymes that are essential to healthy digestion. Myth 4: Your body can’t use the protein from beans unless you eat them with rice. The Truth: Proteins—which our bodies need to make everything from new muscle to hormones—are made up of different combinations of 20 amino acids. Thing is, our bodies can make only 11 of these amino acids; we must get the other nine from food. Animal-based protein-rich foods like eggs and meat provide all nine of these “essential” amino acids, but nearly all plant foods are low in at least one. Experts used to say that to get what your body needs to make proteins, you should pair plant-based foods with complementary sets of amino acids—like rice and beans. Now they know that you don’t have to eat those foods at the same meal. “If you get a variety of foods throughout the day, they all go into the ‘basket’ of amino acids that are available for the body to use,” says Winston J. Craig, Ph.D., R.D., nutrition department chair at Andrews University in Berrien Springs, Michigan. Myth 5: Microwaving zaps nutrients. The Truth: This is misguided thinking, says Carol Byrd-Bredbenner, Ph.D., R.D., professor of nutrition at Rutgers University in New Brunswick, New Jersey. Whether you’re using a microwave, a charcoal grill or a solar-heated stove, “it’s the heat and the amount of time you’re cooking that affect nutrient losses, not the cooking method,” she says. “The longer and hotter you cook a food, the more you’ll lose certain heat- and water-sensitive nutrients, especially vitamin C and thiamin [a B vitamin].” Because microwave cooking often cooks foods more quickly, it can actually help to minimize nutrient losses. Myth 6: Radiation from microwaves creates dangerous compounds in your food. The Truth: “Radiation” might connote images of nuclear plants, but it simply refers to energy that travels in waves and spreads out as it goes. Microwaves, radio waves and the energy waves that we perceive as visual light all are forms of radiation. So, too, are X-rays and gamma rays—which do pose health concerns. But the microwaves used to cook foods are many, many times weaker than X-rays and gamma rays, says Robert Brackett, Ph.D., director of the National Center for Food Safety and Technology at the Illinois Institute of Technology. And the types of changes that occur in microwaved food as it cooks are “from heat generated inside the food, not the microwaves themselves,” says Brackett. “Microwave cooking is really no different from any other cooking method that applies heat to food.” That said, microwaving in some plastics may leach compounds into your food, so take care to use only microwave-safe containers.